Shown above is a line of any length. You are aiming to create a new line that will make an angle of 45° to this line. 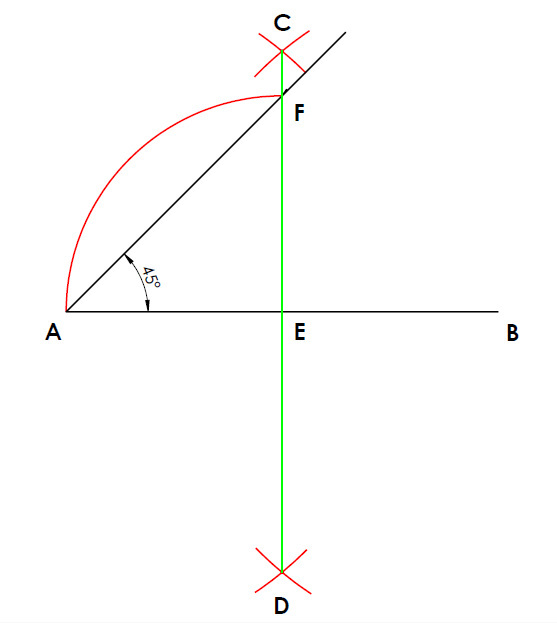 Line Segment CD is perpendicular to AB because it is constructed by bisecting Line AB. See Bisecting a Line if you are unsure on how to do this. Triangle APC is a right angle triangle because we proved that angle AEC was 90 degrees in the first step. Line segments AE and CE are congruent because they are both drawn with the same radius width. Triangles AEC is isosceles because AE and CE are are equal in lenght. Angle EAC and ACE are 45 degrees, because in an isosceles triangle the two base angles are equal and since the third interior angle of our triangle is 90 degree the remaining 2 angles must add up to 90 degrees. Therefore angles EAC and ACE are 45 degrees.